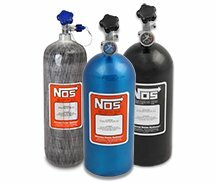 NOS offer complete, Ready-to-Run Nitrous Bottles and Individual Bottle Components and Accessories. 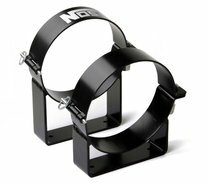 NOS BLACK 10 lb. 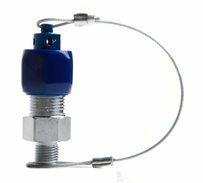 Nitrous Bottle with Super Hi-Flo Valve, 3/8" I.D. Siphon Tube & Black Faced 1-1/2" Dry Nitrous Gauge. Lightweight aluminum inner liner wrapped in carbon fiber weave. Includes quick release bottle brackets and 16 feet of 6AN feed line. Lightweight aluminum inner liner wrapped in carbon fiber weave. 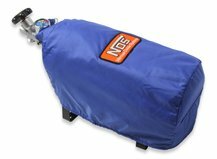 15 lb Nitrous Bottle Electric Blue Finish with Hi-Flow Valve. Includes Racer Safety Blow-Off. 15 lb Black Nitrous Bottle with Hi-Flow Valve. Includes Racer Safety Blow-Off. Bottle bracket mounting plate for the trunk of a 2010 to 2015 Chevrolet Camaro. Billet Aluminum 10 & 15 lb Bottle Bracket 7" Dia. 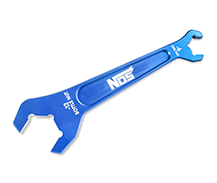 NOS BLACK 10 lb. 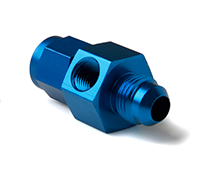 Nitrous Bottle with Super Hi-Flo Valve, 3/8" I.D. Siphon Tube, Black Faced 1-1/2" Dry Nitrous Gauge & Black Racers Safety Adapter. 7" diameter blue bottle blanket with velcro closure. 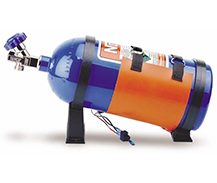 For 10 lb nitrous bottles. 7" Diameter Black Bottle Blanket with Velcro Closure. For 10 lb Nitrous Bottles. 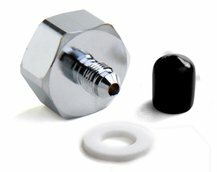 Racer's Safety Diffuser Cap Assembly for use with the NOS Racer's Safety Adapter. Quick Release Hinged Aluminum Bottle Brackets for 10 lb & 15 lb Bottle.